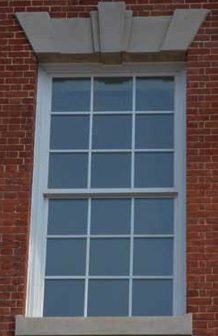 Frame and Sash — Pultruded Fiberglass Profiles, assembled using Custom Composite, Glass Filled Virgin Polyester (PET) Corner Keys and Stainless Steel Screws. Sash are Channel Glazed. 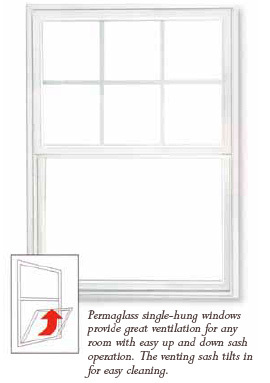 Glass — Cardinal LoE 272 w/ XL Edge IG System - 3/4" overall insulating glass thickness, 3mm - Argon - 3mm edge spacer. Hardware — Premium quality Truth Flange Mount Lock with Concealed Keeper, Tilt Latches and Sash Lift and Ferco Constant Force Balance System. Screen — Black Fiberglass screen cloth in an aluminum enamelled frame. Weatherstrip — Combination Triple Sealing System using SSI - Q-Foam and Fin Pile products. AAMA Performance — HLC45 - 44" x 77"
Test results based on a "Screw Though The Frame" method of installation. Quality Assurance — Standards and Proceedures set-up and administered in accordance with the National Accreditation & Management Institute (NAMI) guidelines. For more information, call 978.416.9495 or send us an email.